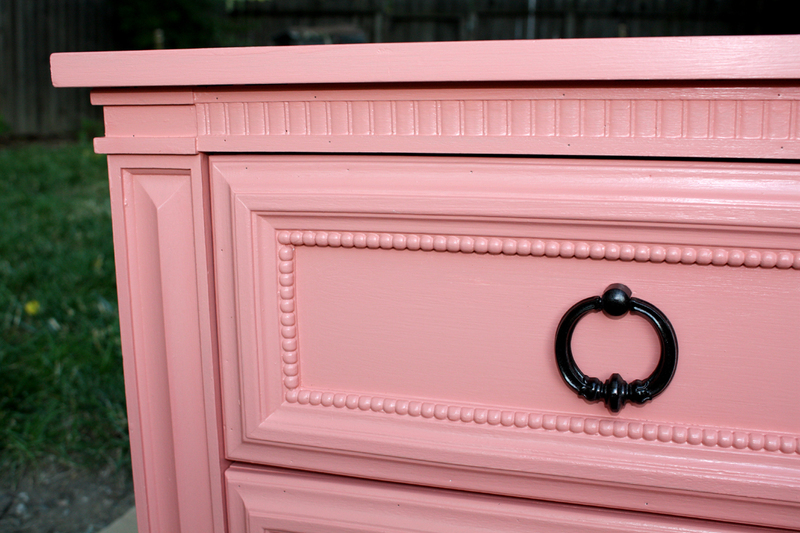 I finally got to do what I love best, paint furniture! 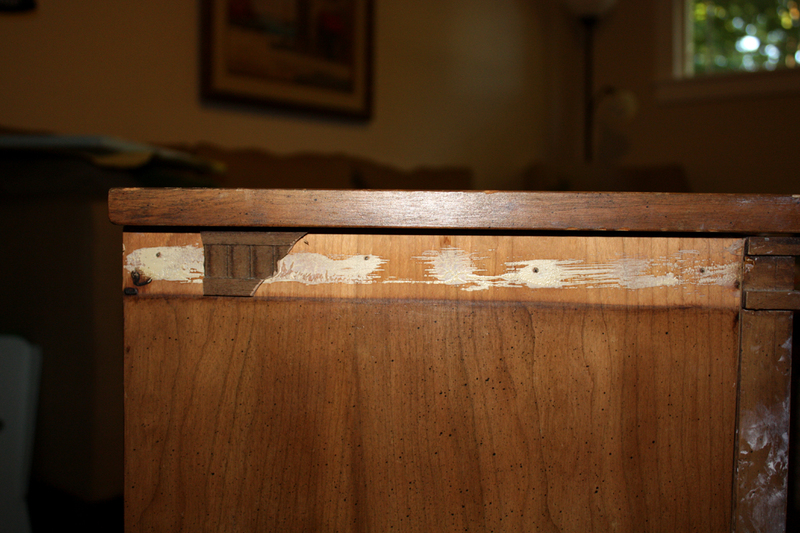 A few weeks back I found a small two-drawer cabinet at the thrift store. It was originally $10 but it was 50% off day so I got it for $5! Although it was a bit grungy it had good bones. 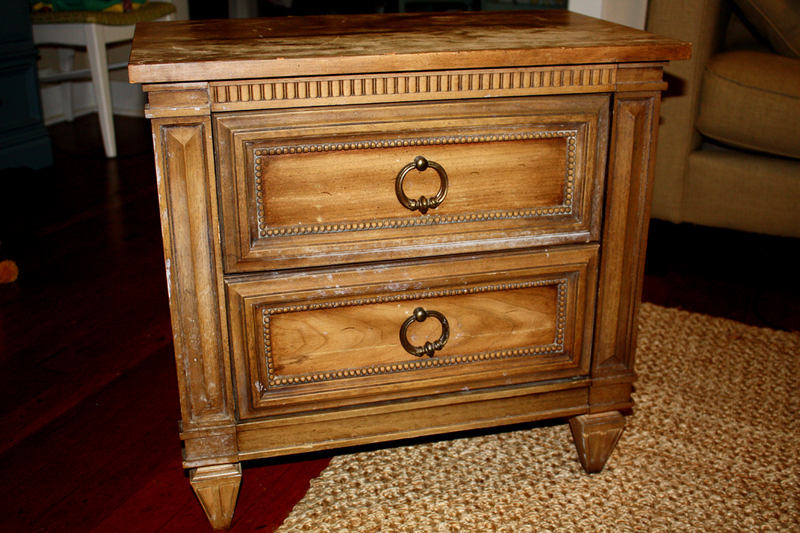 I really liked the design especially the cute pearl-like detailing around the drawers. 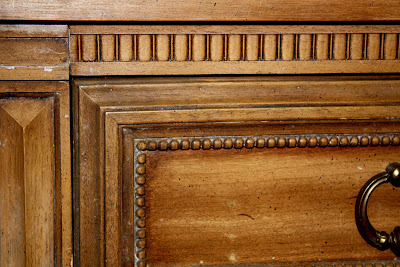 Most of the detailing on both the sides of the cabinet were broken off so I decided to remove what remained and leave the sides plain. 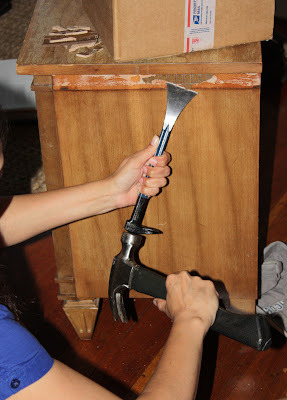 Here I am with a chisel and hammer to chip the remaining detail off the sides. We have smaller chisels but for some reason I thought this was a job for our gigantic chisel?? 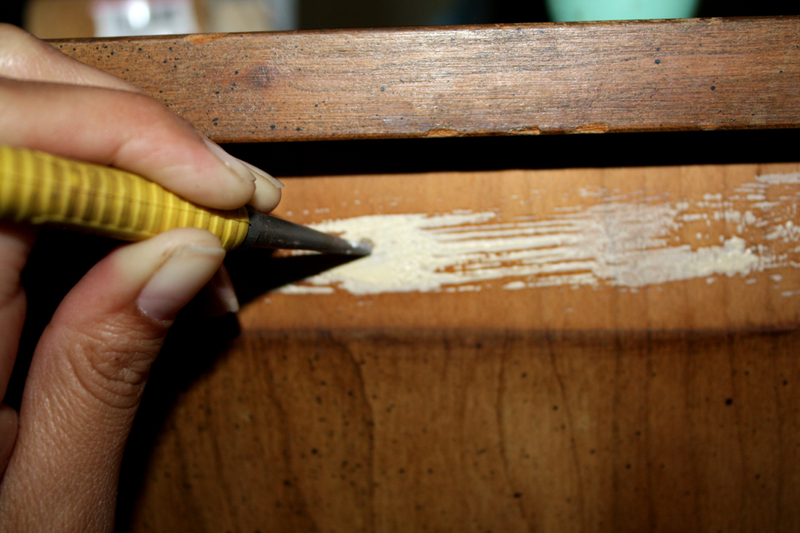 After removing the side detailing I used a nail set to knock the remaining nails below the surface of the wood. 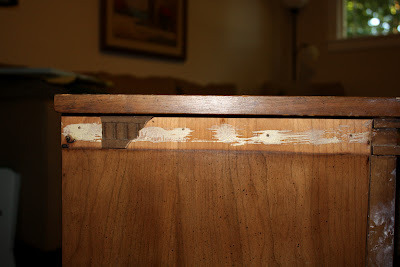 I used wood filler to fill in the nail holes and any dents in the wood. I then did a quick sanding to smooth out the wood filler, old glue, and to rough up the surface of the wood before priming. 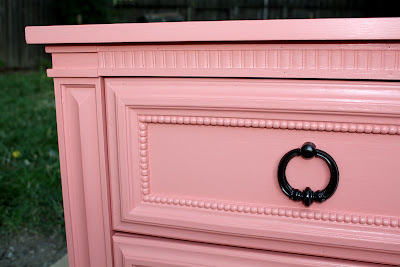 I then applied two coats of Martha Stewart paint in "Peony". 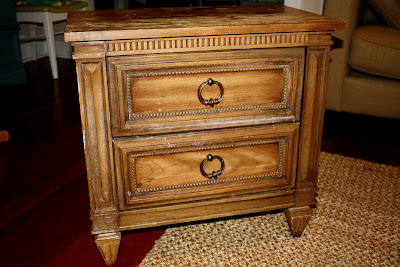 I also painted the cabinet hardware with spray paint in "oil-rubbed bronze". And here it is our fabulous new cabinet! 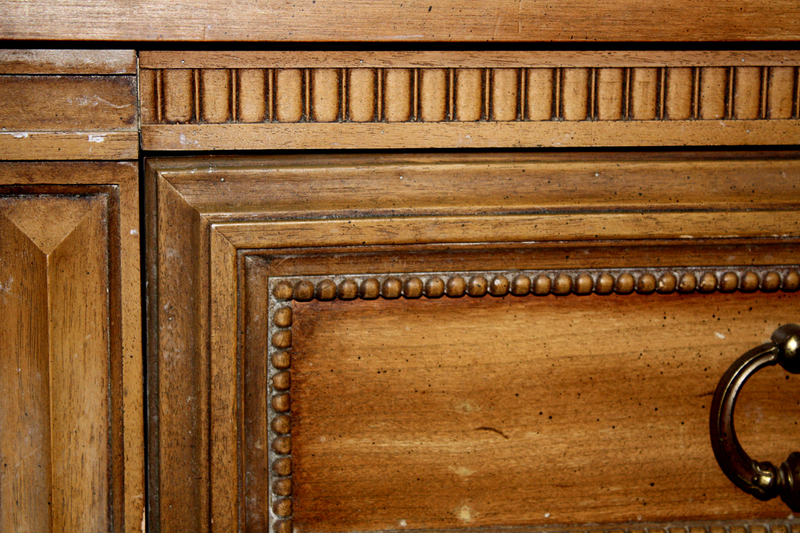 And look at the detailing! Isn't it cute! It found a home in our front bedroom. I'm planning on incorporating some coral colored-items to go with the light blue for a beachy/ocean type vibe. 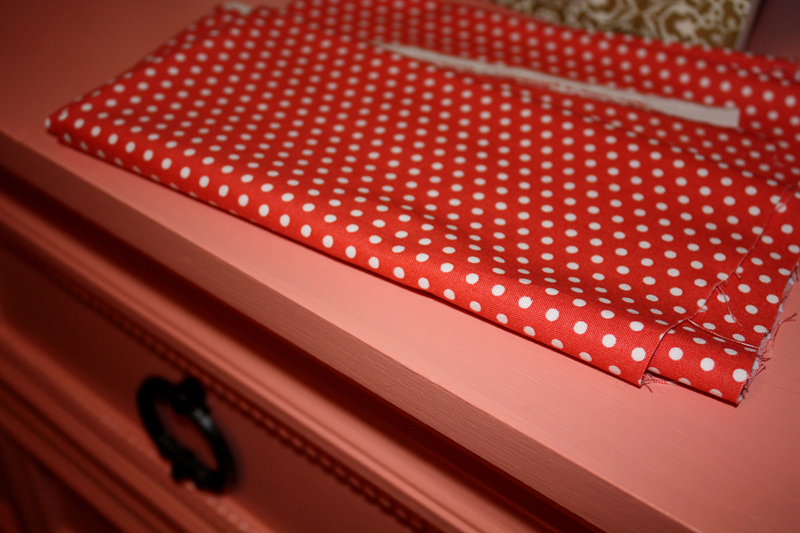 My cabinet is a little more on the pink side but I wanted more of a coral color than orange to match some fabric I plan to make a pillow from. So that's the plan for the front bedroom. Woohoo for furniture painting! so cute! i love that color- it is so pretty! 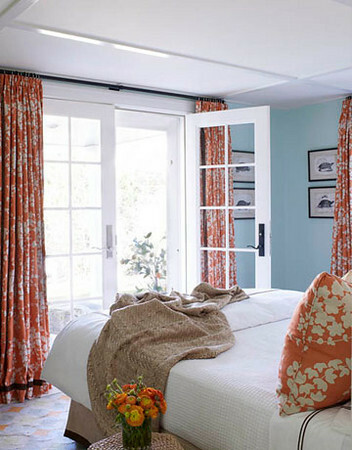 i love that color combo, too- the coral and beachy aqua- it's so pretty and fun! What a bargain! I can't believe you got that for only $5. And the transformation is amazing. The pink/coral color is so cute, and different from all the white paint jobs out there! Love your inspiration pics too. Aqua and coral are one of my favorite color combos. 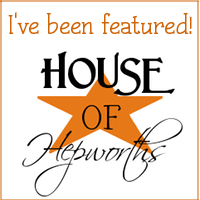 Found you at The Shabby Chic Cottage, and now I'm off to check out the rest of your blog. 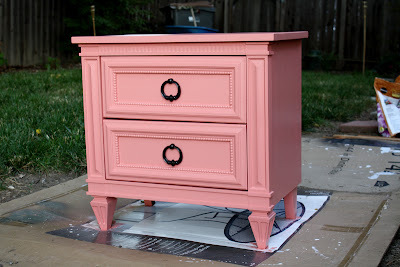 I just painted two nightstands very similar to yours RED (although I must say, yours has cuter details). Peony is such a pretty color and it turned out fantastic! This looks great! I love the colour! How cute! I love the piece alone and you've made it even better:) I found you at Creations by Kara, great post. I adore that color! Great job! I love the table! I love the color! I even love the NAME of the color! You did a wonderful job! It looks so pretty~ just perfect! It's gorgeous darling!! My daughter would love it in her room even though she's only 1!! Thanks! That's what I thought too, the color would go perfectly in a little girl's room. Thanks again! What a deal! You have made it FABULOUS, for sure! Have a lovely weekend!